Cantabria, a region of Northern Spain, is fishing ports and snowy peaks. This scenic and enchanting region of Spain is best known for its dramatic landscape including beautiful beaches, charming seaside villages and some of the highest peaks found in the country. A region as vast and diverse as Cantabria and its people have many things to be proud of, and one of them comes from one of its most scenic mountain villages, Potes. What does Potes have that everyone knows? This municipality is one of the most attractive in Cantabria thanks to its geographical features. Surrounded by a spectacular landscape and located at the confluence of the four valleys of the Comarca, the town reveals its rich history at every step. It appears mentioned documentarily since the mid-ninth century and since the late Middle Ages was linked to the House of the Marquis of Santillana. Potes is known as the town of bridges and towers. Its narrow streets and mansions help the visitor to imagine past times full of history. Undoubtedly one of the most significant aspects of Potes and the whole region is its gastronomy. Special mention deserves the famous liqueurs of artisan elaboration, ‘the Orujo Liquor’ but… What is ‘Orujo’? The word comes from the Latin Language and is a spirit or brandy obtained by distillation of grape skins. So much is its importance and tradition in the Comarca that around this liquor has come to consolidate a very popular party to promote a product that is made in alquitaras or alembics with the harvest of the many vineyards in the area. The Festival gathers thousands of people every year willing to taste this typical liquor with an old elaboration system. It was held for the first time in 1984 and currently takes place on the second weekend of November. During the party, the visitors can be present in a public distillation of the Orujo and then taste it in the streets of the village. In addition to the Orujo, other products and recipes from the area are also tested during this party, such as ‘lebaniego stew’, borono (pork’s gut) with apple, Picón cheese and plenty more… All this is combined with an entertaining program of musical performances and folkloric atmosphere. The origin of the elaboration goes back to the harvest of the vineyards in the monasteries of the High Middle Ages. The ‘Orujo’, together with the wine, served as currency for commercial transactions, even as a species for the payment of taxes. In 1984, and to explain and publicise the complex process of making this brandy, the first festival is celebrated, becoming one of the most deeply rooted in Cantabria. Popular wisdom along with oral tradition has maintained its ancestral system of elaboration until today, which has remained the same since the Middle Ages. The festival was established in 1984, later it was banned, as was the homemade distillation. Since 1994 this prohibition is abolished only in the days that this festival is celebrated. Inspectors disentangle the alquitaras (alembics) that participate in the festival, and once the acts are completed, they are re-sealed. 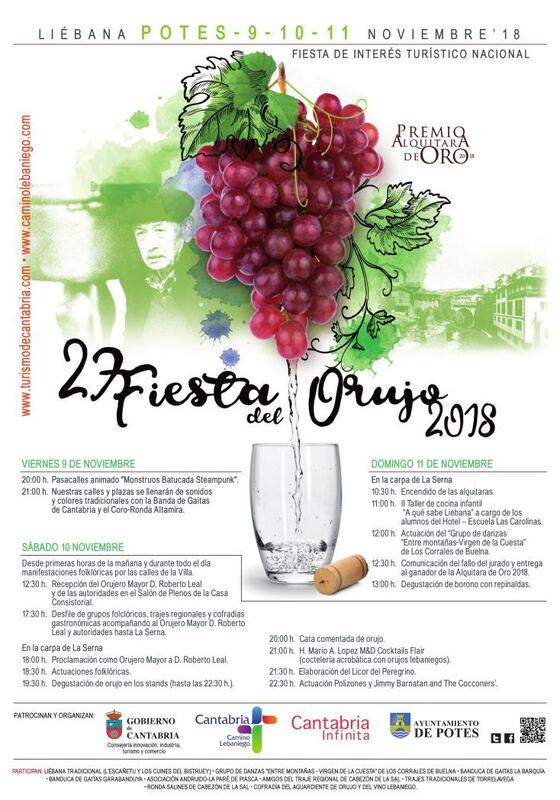 It imposes a condition of the most curious and interesting: all the Orujo that is distilled during the festival should be consumed at the time. It was declared a Festival of National Tourist Interest in 2012. The ancestral rite of the artisan distillation begins, as it was done for centuries: Parades wearing the typical mountain costumes through the old streets of Potes and the proclamation of the Orujero Mayor, it is the beginning of the Festival. The alquitaras, of Arab origin like the alembic and made by hand with copper and tin, are lit. From these old Arab copper alembics comes the most precious ‘orujo’, pure craftsmanship, liquor of the gods. The standard ‘Orujo’ is white in colour as it comes that way directly from the alquitara. Other varieties are products of the mixture of this ‘brandy’ with sloes, cherries, port tea (local herbs), flowers or honey. This great autumnal event invites us to enjoy this rite and to taste the Orujo in the same place where it was born. Any excuse is good to visit us, to visit Northern Spain and to experience the magic our traditions! A small taste of the divine at the Fiesta del Orujo!